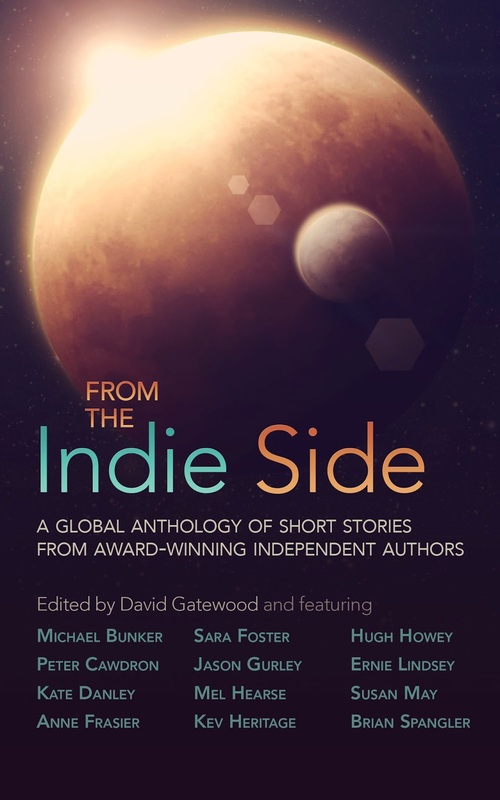 Quick Review: "From the Indie Side" is an exciting global anthology of short stories from award-winning independent authors. Including a wonderful story and foreword by HUGH HOWEY, New York Times bestselling author of Wool. "...it is a great book. It is one that you will want laying in the stack next to your bed or chair or sofa or desk - wherever you read - because you will want to read it over and over throughout the years." Michael Bunker, bestselling Amazon author of Wick and Kindle Worlds bestsellers. Love, Loss, Courage, Hubris, REBELLION. A man who remembers the future and a veteran haunted by his past. A witch ignorant of her powers and a vampire achingly aware of his emptiness. An unmaimed man, a cursed queen, a troubled marriage, a family just trying to survive. From an abandoned convent to a Martian classroom, an open-mic reading to a New Mexico mountaintop, these fantastical and imaginative tales will take you on a journey through impossible worlds, all-too-possible futures, and disquieting glimpses into the other side of reality. I think the book was newly established form factor and I would say it would intrigue, inspire and puzzle many people who has read these stories. It's very interesting because I have read quite a few books similar to this type of form. Therefore I find this book and its stories are quite exciting. THE WINTER LANDS by Jason Gurley; A story about great courage and commitment. It's about a man who is called Jonathan Froestt; he lives a simple life in a small retirement apartment and he owns a small bookstore that is about to be demolished. During his lifetime, he has dedicated all his resources into developing a book. Jason Gurley (the author) has written such a significant and touching story that made me feel puzzled. It's probably because of the story within the story; a simple paradox that was effective enough to get me thinking. GOING GRAY by Brian Spangler; I found the second story intriguing and it showed me we can't control nature. The story is kinda plain however it developed a show of emotions and created an atmosphere about how technology can destroy or save us. Brian Spangler (author)'s style of writing is very in-depth and mysterious. It makes the readers wonder what comes next. I like how in the end they left a character called Emily and her brother in the shopping mall and leaving a cliffhanger. It definitely creates this situation about a sudden pause between the story and its writer. QUEEN JOANNA by Kate Danley; The style of Kate Danley's (author's) story was written with this dark and murky kind of atmosphere. The era of the story is set during the historical time of englishmen and their suits. The story mentioned about Bloody Queen Mary where she returns as a spirit to haunt Joanna. The story was quite dark and had this fearful atmosphere here and there. It made me think about the characters as demented souls. They were created deeply in thought. Completely devoid of love and fearful of death, Danley (author) actually had me interested with the cunning story. MOUTH BREATHERS by Hugh Howey; The scene is set where there is boy named Cort and he is from earth. One day he had to go to mars to live there. There is no explanation why he had to go there and it starts from some random day. However on that random day he meets a girl who i suspect he now likes. Hugh Howey has written this in such a boring manner (SORRY) it basically talks about this boy in a school in mars that falls for this girl while he was playing with robots? Then he is in a car where he is talking to his mother that constantly checks on him throughout the day. I'm very sorry but this story had no purpose and lead to nowhere. It's interesting in the fact that it was set on mars and he explained how he had to breath but if it was set on theoretical earth it would just be any other day. Needs improvement. Why did this government take away a leg? For every single citizen? Other than that everything was very good, I liked how the daughter of the head of security would destroy and plant a bomb in the main building and when Rowan turned sides; that really surprised me in every imaginable way because I saw Rowan as that saviour, the man who was the guardian angel of the chosen one or something of the sort. Overall in the end when the daughter (Meredith) of the head of security went to visit Cray (Main Character) and showed him her scars, it felt weird i didn't know if she wither hated the real world or loved it. She got scars and a destroyed ear yet she seemed so calm. Thats what i loved about this story. It leaves the wondering to you. CIPHER by Sara Foster; Cipher is an amazing story about courage, innocence and stupidity. I loved it. Even if it somewhat made no sense that there was some random ex-military guy who had access to a bomb large and destructive enough to cause an EMP attack. A bomb that large is on the scale of a nuclear bomb. Thats the only thing that was weird about this story, but putting aside that fact, the story might have been somewhat possible. Everything explained itself and everything came up to par with my standards. When she traveled to her dad's house though and she couldn't find her way back? That was really dumb of her. But it is a story and as a story, i loved it. simply not possible but as a story, one of the best. MADE OF STARS by Anne Fraiser; This is the most beautiful short-story I have ever read in my entire life. Stories like this have been attempted before but this is by far the best I've read, never has such a story been incorporated into such a short story. Most stories that go along these lines usually are in books a thousand pages long. The fall, the chase, the heartache. How she describes what happens is so touching, it made me tear up. It talks about an immortal who has alove story with a mortal. I rarely like these kind of stories but this story really made me wonder whether in real life, is it possible? Everyday in our lives we past strangers who we feel we know and we sometimes feel what Lila has felt. A story like this can change a person, show them an insight into such a deep and meaningful subject. The story is so fragile yet it can create a sense of pity for the immortal how he tries to love her but cannot, watch how she grows old and such. I don't want to destroy the story or spoil it. Pick up the book and read it. It may break you or make you. GYRE ~ WITCHERY by Kev Heritage; This story will intrigue you. At first i thought it was going to be some common story about the future and blah bla bla, but instead what i got was something much more different. I got a story that talked about what if the human race evolved into something so much more, something that alienated humankind and changed us. People usually associate the future to be full of technical advances, a perfect society that overpopulates and cannot sustain itself. Well, This story fits the fact that it is really over populated until they take over other galaxies. However it seems as if technology has maybe moved backwards for humans. Interesting. find his writing extremely effective and definitely good. The story is good and you should pick up the book to read this short story yourself. I don't think my words could describe the originality of this piece. So common but yet the way he wrote it made it uncommon. Something more special. THE WAR VETERAN by Susan May; She never explained whether it was real. It was so unbelievably cool the way she described it. Susan May of course. She's one of the best writers in this book. Not the best but one of them. I loved this story, it made me feel that people can have courage, that cowards can change, even i can change. Never have i ever felt such an experience of war but this story was so immersive, i could feel the main character talking to me, it was an unrealistically amazing moment. The exhilaration and the emotions. The ending. All of it came toghether so well when the veteran sees the person and finally is able to hear what he really said. This story could be one of the best in the book. Just with the emotional wreckage war can display. THE GREATER GOOD by Mel Hearse; This story is extremely hard to describe using my own words. Its so good, I don't really know how to explain it. The piece should be judged as you, as the reader should well, read it for yourself because reading this story will decide and help you understand. It's something that can't be told but can be read and experienced for yourself. I guess the story had felt fundamentally fulfilling that you gotta read it for yourself! REDOUBT by Michael Bunker; This was a short story, straight to the point but effective in english. I actually found this a tad bit boring, honestly I kept feeling like something was supposed to happen but nothing really did. It was a page turner, no doubt but i feel there was too much suspense until it felt saturized, by the end when they parted, I didn't feel much for this story. THE MAN WHO REMEMBERED TODAY by Peter Cawdron; When people say "let's save the best for last" I do believe that phrase works here. This was the best short story in the book, hands down. I loved it so much I read it a countless amount of times hoping for it never to stop. This is the ultimate story I've ever read. Never missing out and providing the reader the amount of excitement he needs. THIS CANNOT BE REVIEWED. It's honestly one of the best short stories out there. Brief Review: Pick the book up! It has the most diverse collection of short indie stories! It's a collection about beauty, love, darkness and destruction that combines into a anthology of priceless pieces. Final Rating: 4/5 "Liked it!"